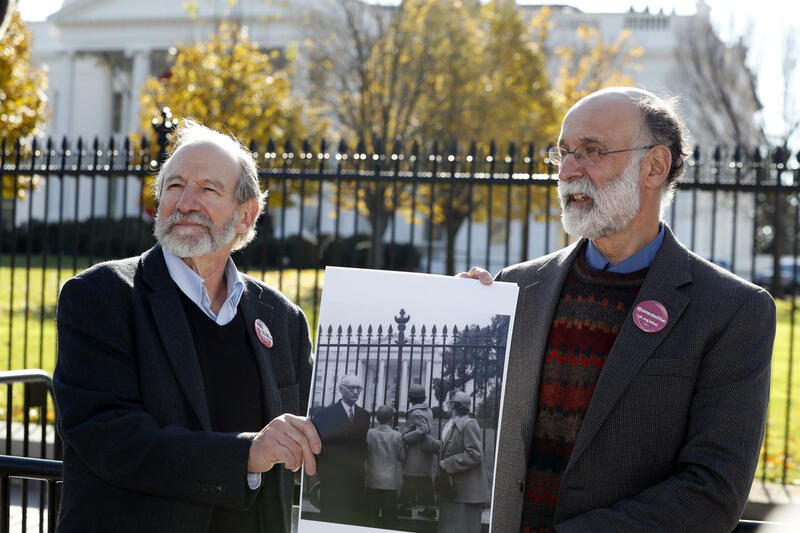 WASHINGTON -- The sons of convicted spy Ethel Rosenberg returned to the White House on Thursday, more than 50 years after pleading unsuccessfully to spare her life, in a last-ditch appeal to President Obama to exonerate her amid new evidence. As young boys, Robert and Michael Meeropol visited the White House in 1953 in a failed bid to get President Dwight Eisenhower to prevent their parents’ executions. Half a century later, the brothers approached a guard booth outside the White House and asked to deliver their letter to Mr. Obama. No matter, the brothers said. They’ve already sent a hard copy to Obama senior adviser Valerie Jarrett, and are hoping Mr. Obama will act before leaving office. The White House declined to comment. In an interview broadcast on CBS’ “60 Minutes” in October, the Meeropols told contributor Anderson Cooper that an exoneration would have personal and political meaning. It’s not clear what action, if any, the Obama administration will take in its waning weeks. But Rosenberg’s supporters believe their prospects are dim once President-elect Donald Trump takes office, in part because Roy Cohn, once a lawyer for Mr. Trump, was a member of the Justice Department’s prosecution team against the Rosenbergs.